Mohammad Abbas and Bilal Asif rocked Australia with the bowl while Fakhar Zaman and Azhar Ali smashed half centuries to put Pakistan in the driving seat of the second Test on Wednesday. 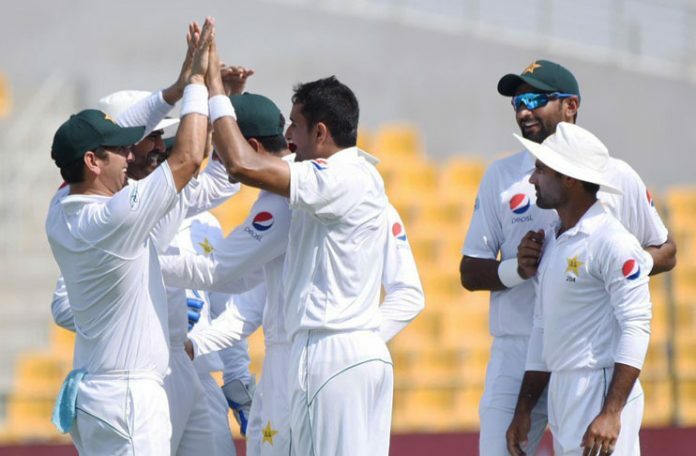 Abbas’s 5-33- his third five wicket haul in Ten tests, and Bilal’s 3-23 helped pakistan bowl out Australia for 145 and then Pakistan finished at a solid 144-2. That gave Pakistan a lead of 281 with eight wickets and three days to enforce results in their favor and win the series 1-0. Azhar Ali finally back into form and was 54 not-out alongside Haris Sohail who will open his account on 17 runs on day 3 of the match. Mohammad Abbas was the chief destroyer of Australia, taking his third five-wicket haul with 5-33 as he wrecked the Australian batting line. In the fourth over of the day Abbas had Shaun Marsh caught for three followed by Travis Head who made 14 runs. Australia were reeling at 56-4, but it wasn’t enough as Yasir Shah tripped Mitchell Marsh for 13 before Bilal Asif came into his own. Asif removed the dangerous looking Aaron Finch for 39, had Tim Paine for three and Nathan Lyon for two. Abbas returned to have Mitchell Starc for 34 — the second top scorer of the inning as Pakistan took a big 137-run lead. Asif finished with 3-23 while Yasir had only one wicket.